COME SEPTEMBER was a pretty substantial hit in 1961, its grosses of $6,500,000 making it Rock Hudson’s sixth most successful picture, and co-star Gina Lollobrigida’s most-seen movie role. Directed by Robert Mulligan, it’s a cheerful, frisky, dated farce, yet another entry in the Coitus Interruptus School of Situations, wherein most of the jokes revolve around frustrating someones libido. Rock plays a millionaire who repairs annually to his Italian villa with mistress Gina. This year, the lovebirds show up two months early, to find their trusted caretaker/valet has turned the villa into a hotel, full of giggly American teenagers (girls), and hep-cat American college types (guys). As the varying morals and ethics of the two generations combine to keep everyone from getting laid, the story goes on and on, outstaying it’s already belated welcome by a good half-hour (it runs 112 minutes). While the sexual complications and their engendered gags aren’t going to send you tumbling over backwards, at least it’s all painless. Hudson fans got their Rocks worth (yes, I could have said ‘off’, but decorum held me in check) since he was also scoring that year with Doris Day in Lover Come Back and Dorothy Malone in the pulpy western The Last Sunset. For those agog over the ampleness of leading lady Lollo, that will be diversion enough to peek in. Bobby Darin, as the hippest of the junior varsity team, did the bouncy title theme and sings “Multiplication”, one of his chart hits. 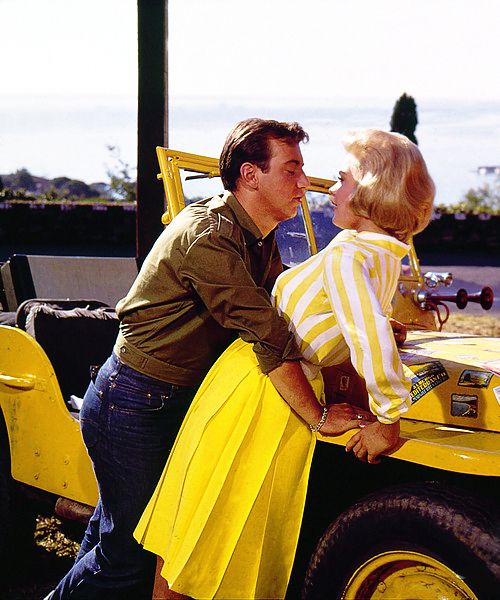 He also made an impression on co-star Sandra Dee: they got married after finishing the flick. If movie stars and pop idols of the past won’t keep you glued, then maybe the bright Italian scenery will: the villa is located on a hillside, high above Portofino, and the views are mouth-watering. With Walter Slezak, Brenda De Banzie, Joan Freeman, Joel Grey.